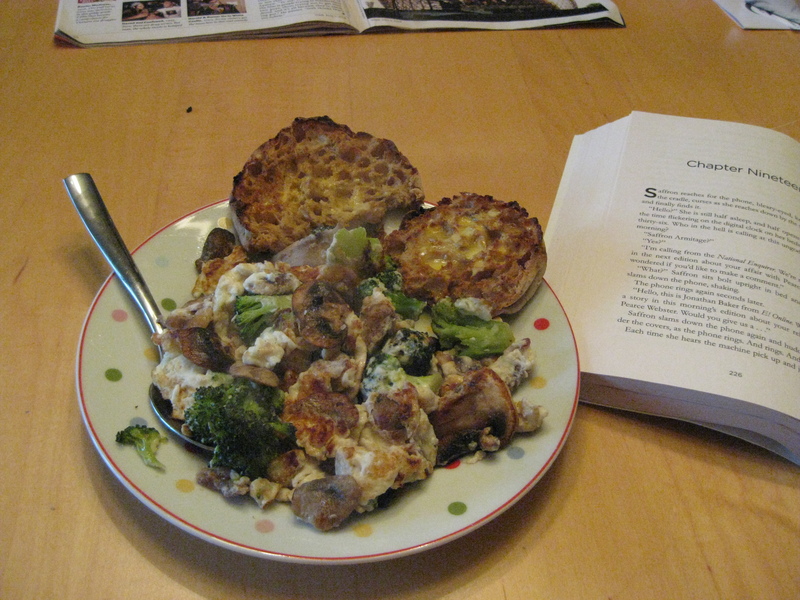 This morning, after a good night’s sleep, I turned the oven to 375 and threw in the breakfast strata I made yesterday in preparation for our company. It was so easy! I love when you can pre-make something so it is ready with no work when you need it. Cut bread into cubes – like 1/2 in. by 1/2 in. 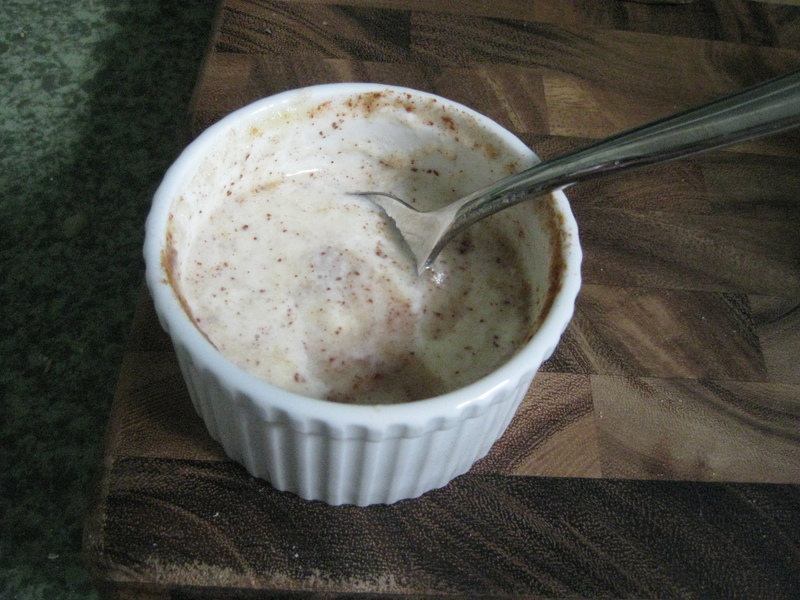 In a bowl, mix egg whites, syrup, milk, cinnamon and vanilla. Cover the bread with the mixture. Cut cream cheese into little pieces and place throughout the dish. Cover with foil and keep cold in the fridge. Let dish set for 10-12 hours/overnight at least so bread is soggy. Bake at 375 for about and hour or until egg is cooked throughout! Brunch with the fam is always a treat! There is always tons of delicious food and of course great company. This particular brunch was held at my cousin Cindy and her husband Tom’s house. They live right up the street from my parents. 2. Cut all pieces into small pieces ½ inch by ½ inch. 5. Crack all eggs into a bowl. 6. Mix eggs, syrup, vanilla, cinnamon, sugar and milk together. 7. Pour mixture onto bread and cheese. 8. Let soak overnight . If bread looks dry in the morning, add a few more eggs and milk. 9. Bake at 350 for an hour. This morning I woke up with a little headache so before I went for a walk, I decided I needed some nourishment. After reading reviews of Cliff Bars, I bought a few yesterday. I was excited to try the Carrot Cake bar today. 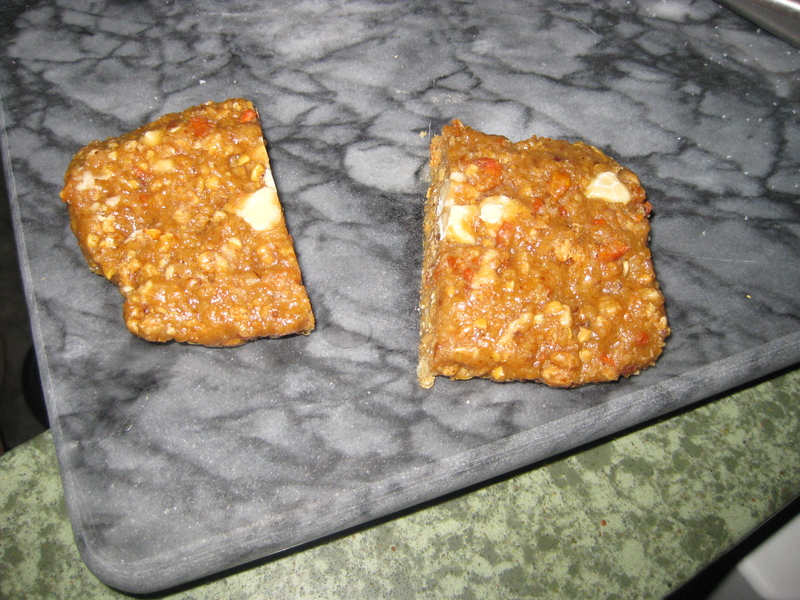 Because I knew I would want breakfast when I got back from walking, I cut the bar in half and saved one half for later. Here is a picture of the “naked” bar. Of course I ate the bigger half this morning! For some reason it tasted really good cold and chewy this morning! 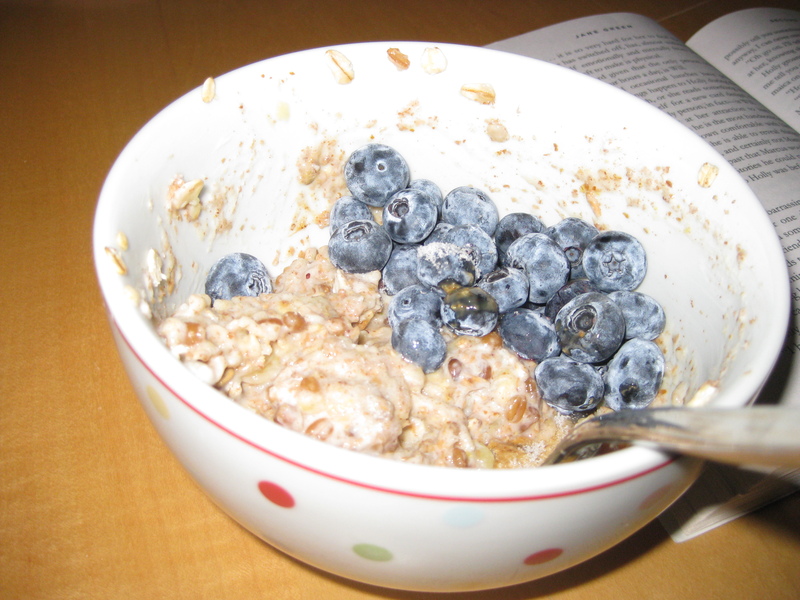 I am planning on making the oatmeal pancake soon! I will let you know how it goes. I forgot to write about breakfast which was new and exciting! 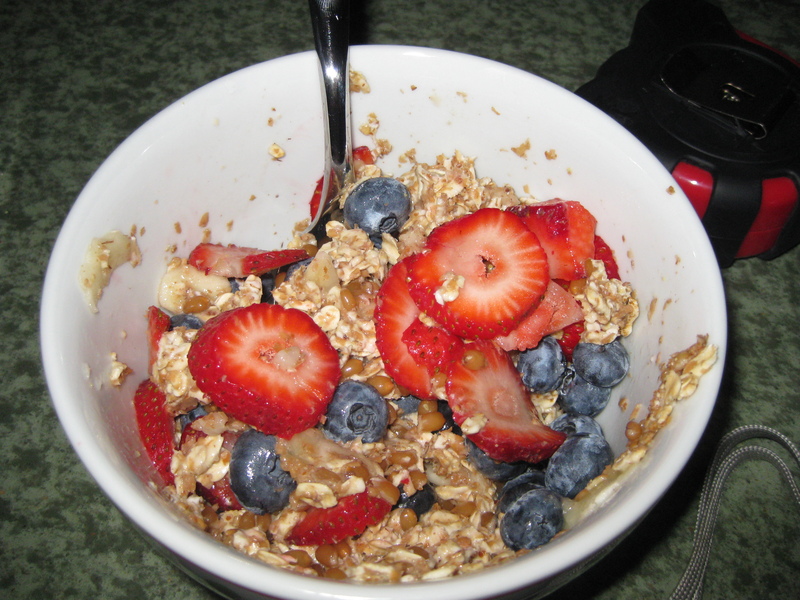 I made wheat berries yesterday and was eager to eat them this morning. I followed the directions on how to cook them. 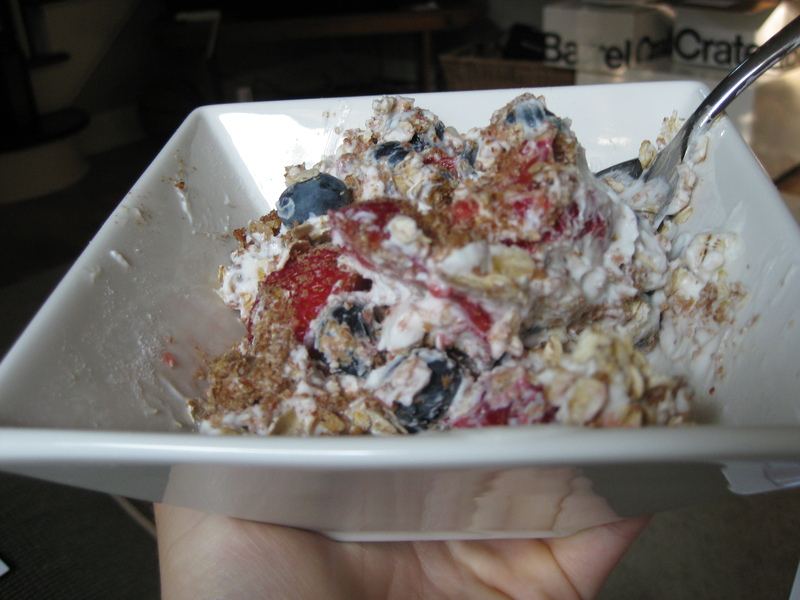 This morning I cut up strawberries and blueberries and mixed them with 1/2 Fage and a tsp. of both ground flax and wheat bran. 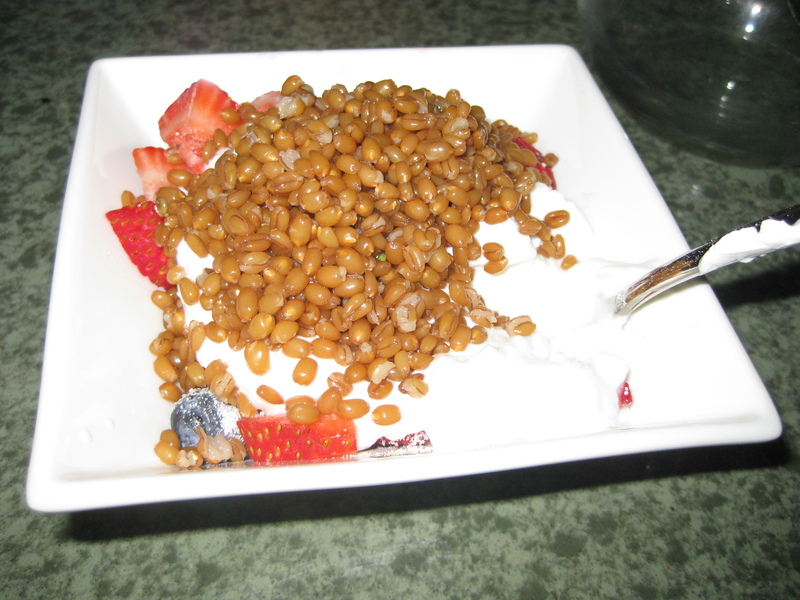 I loved the nutty, chewy texture of the wheatberries and I am excited to start using them in other dishes!! Here is a great recipe I tried with company on Sat. night. 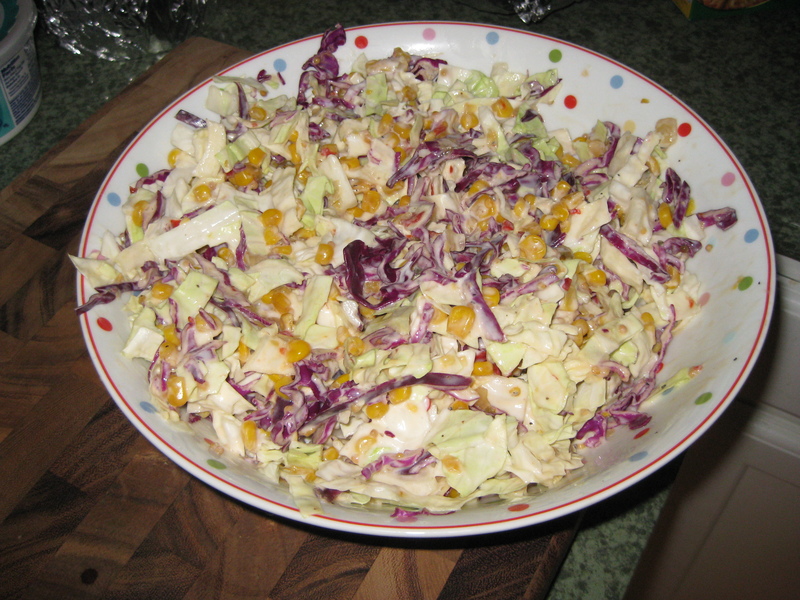 We were having ribs and this spicy, creamy, easy, healthy coleslaw was perfect! Mix all of the above together and serve. 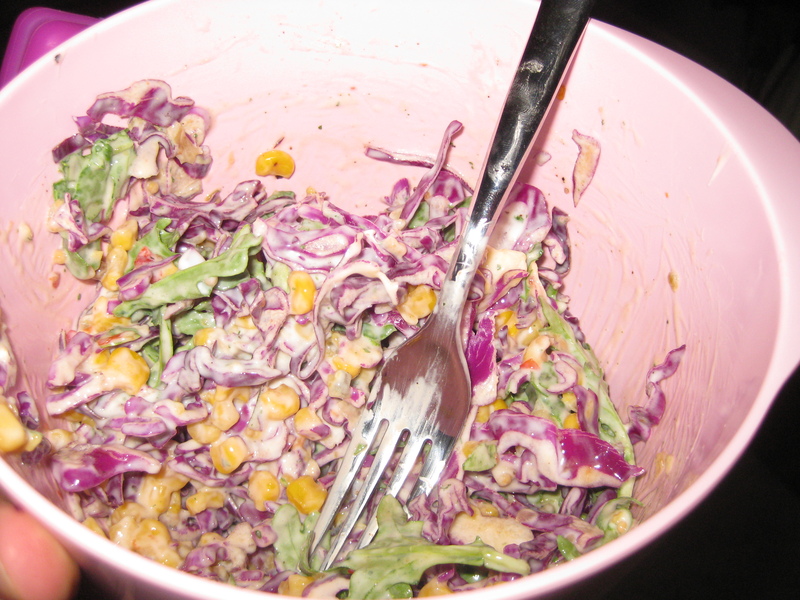 This can be eaten the next day, but the fat free ingredients tend to get a little watery. I just dumped out the water and enjoyed again!